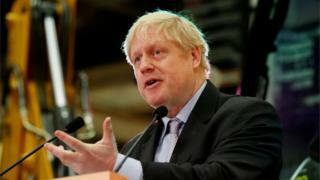 Boris Johnson was wrong to claim there was polling evidence that a no-deal Brexit was the public's preferred option, the press regulator has ruled. Ipso ordered the Daily Telegraph to print a correction after finding the MP's column was inaccurate. The claim was made in a piece headlined "The British people won't be scared into backing a woeful Brexit deal nobody voted for" in January. The Telegraph had argued it was "clearly comically polemical". The column appeared a week before MPs rejected Theresa May's Brexit deal for the first time, by a historic margin. The Commons went on to reject the withdrawal agreement in a further two votes. In his piece, prominent Brexiteer Mr Johnson, who quit as foreign secretary over Mrs May's Brexit strategy last July, wrote: "Of all the options suggested by pollsters - staying in the EU, coming out on Theresa May's terms, or coming out on World Trade terms - it is the last, the so-called no-deal option, that is gaining in popularity. "In spite of - or perhaps because of - everything they have been told, it is this future that is by some margin preferred by the British public." According to Ipso, the newspaper argued that it was clearly an opinion piece and readers would understand that it was not invoking specific polling - and that the Conservative MP's column was "clearly comically polemical" and would not be read as a "serious, empirical, in-depth analysis of hard factual matters". And it argued that various combinations of results in four polls reflected support for a no-deal scenario over Theresa May's deal or remaining in the EU. But following a complaint that it was inaccurate, Ipso said the article, published on 7 January, failed to provide accurate information with "a basis in fact" and ordered a correction to be printed. In its ruling, Ipso said that while columnists were free to use "hyperbole, melodrama and humour", they must take care "over the accuracy of any claims of fact". It said the Telegraph had not provided data to back up the claims and had "construed the polls as signalling support for a no deal, when in fact, this was the result of the publication either amalgamating several findings together or interpreting an option beyond what was set out by the poll, as being a finding in support of a no-deal Brexit". It found it was a "significant inaccuracy, because it misrepresented polling information" and upheld a complaint that it had breached clause 1 of the Editors' Code of Practice.